Nowadays we all know Mario and Luigi as adventurers and heroes of the Koopa Kingdom, but there was a time when they were just a couple of simple plumbers. Or maybe not so simple - the evidence would suggest that these two had one of the flashiest marketing campaigns in the plumbing game. Maybe it’s different in other places, but a pair of brothers with big, bushy mustaches, wearing matching, color-coordinated overalls and oversized hats sporting their own initials? Where we come from that’s going to be by far the most attention-getting plumbing partnership in town. 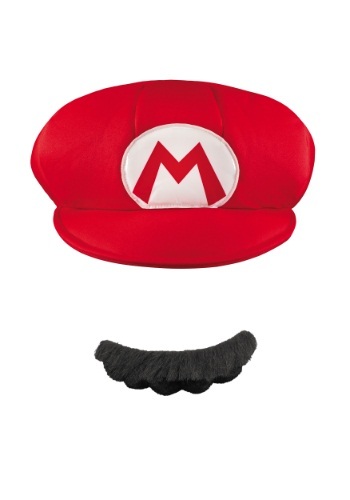 Showcase your own flair for self-promotion in this instantly identifiable Mario gear. Just pull on this puffy, elastic-backed, foam-filled, polyester hat with an appliqued “M” logo and affix the faux fur mustache (adhesive included) to your upper lip and you’re all set to slide down some pipes, bop some goombas, and maybe even rescue a princess or two. Or just find a friend in green and launch the most identifiable plumbing company in your neck of the woods. That might wind up being the more lucrative option, but it probably won’t be quite as much fun.